Brickr Ransomware is a malicious computer infection no one would want to encounter. It is part of the ongoing ransomware plague that has been terrorizing computer users worldwide for quite some time now. Although it is often hard to deal with the ransomware infection consequences, it is necessary to maintain the clean computer system. Therefore, disregarding what might happen to your files, you should make sure that you remove Brickr Ransomware from your system at once. Please seek out professional help if you need assistance with the ransomware program’s removal. It is always a good idea to make use of professional help you when dealing with malicious computer infection. It would be possible to avoid this infection if you were more focused on the distribution methods that are employed by similar programs all over the world. The research suggests that Brickr Ransomware probably spreads via spam emails. Normally, spam email messages get filtered into your Junk folder when they land in your inbox, but the messages that distribute ransomware are sophisticated enough to get into your main email folder. That is because they look like legitimate notifications from reliable websites, and users seldom think twice before they open such mails. What’s more, it often looks like the spam messages carry some important information, like your financial report or some online shop invoice. This “important” document is added to the message as an attachment. In fact, if you receive an unexpected email from an unfamiliar party, and it has an attached file, there is always a chance that someone wants to trick you into opening the file so that they would infect you with something. Of course, you might have been waiting for some important document, and the attachment in question might be it. But if you are not 100% sure, it is always a good idea to scan that file with an automated antimalware tool. Needless to say, Brickr Ransomware behaves just like any other ransomware infection out there because upon the infection it will scan your PC looking for the files it can encrypt. After a few tests we have found that the program encrypts XML, GZ, JPG, TXT, ZIP, MP3, BMP, and WMV file formats. Normally, after the encryption, the affected files have an additional extension added to them by the ransomware program. However, Brickr Ransomware does nothing of the sort, and there is no other way to see whether the file has been encrypted but to try and open it (if it still opens). If your system cannot read a particular file, it has obviously been encrypted. Personal files have been encrypted! !!!!!!!!!!!!!! READ THIS TEXT CAREFULLY!!!!!!!!!! All of your personal files (documents, photos, videos, archives and other files) were locked and are not usable at the moment. To verify this fact, try to open some of your files and use them. To get your files back you need to buy a secret key. We are the only people who have the secret key. Nobody but us can restore your files. Not even antiviruses or IT experts. To verify this fact, we can decrypt 1 of your files for free. Send us the file to email show below (Contact Email:) and we will sent it unlocked back to you for free. As you can see, Brickr Ransomware tries to make you think that unless you pay $55USD, it will not be possible to restore your files. It could be true, if the criminals behind this attack would issue the decryption key in the first place. However, there is no guarantee they would do that even if you were to transfer the payment. 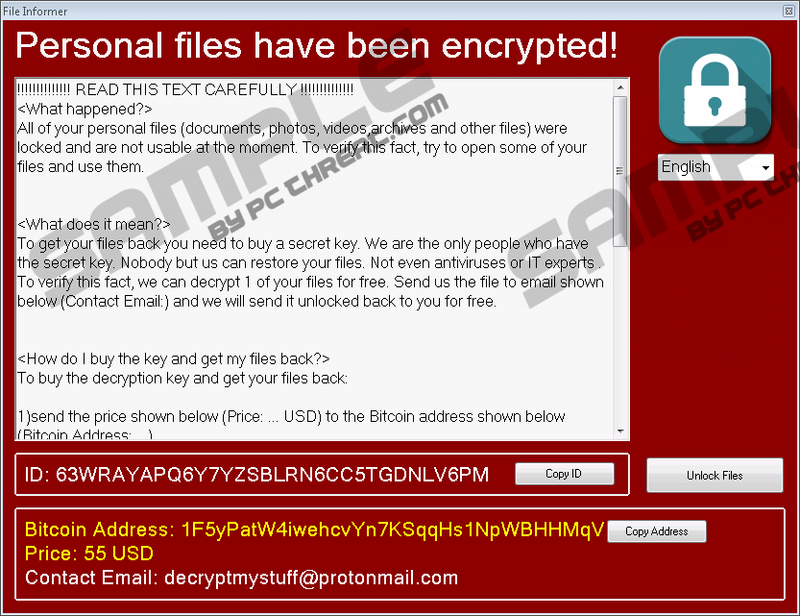 Sometimes it is possible to decrypt the affected files with a public decryption tool, but there is no such tool available for Brickr Ransomware at the moment. Therefore, the only way to get your files back is to transfer them into your hard drive from an external or virtual backup. That is, assuming, that you back up copies of your files on a regular basis. Before you do that, of course, you need to remove Brickr Ransomware for good. Although manual removal is possible, you should consider deleting the infection with an antispyware tool too, because an automatic removal is a lot more efficient. Press Ctrl+Shift+Esc and open the Task Manager. Open the Processes tab and end suspicious processes. Remove the recently downloaded files. On the right, right-click the WidnowsNetworkingSvc value name with value data random exe file and delete it. Right-click the WidnowsNetworkingSvc value name with value data READ_DECRYPT_FILES.txt and remove it. Close Registry Editor and run a full PC scan. Quick & tested solution for Brickr Ransomware removal.